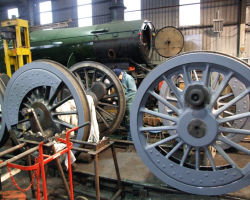 Work continues to clean and paint the wheelsets before their removal to the South Devon Railway for tyre turning and any other attention needed to journals and crankpins, which will be in the next few weeks. They will be crack tested prior to sending. 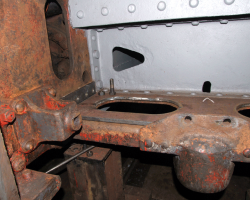 The hanger brackets for the springs were examined once all the pins had been removed, and several were found to have worn oval due to the engine’s weight bearing down on the tops of the holes. All twelve are being removed for refurbishment and possible renewal. 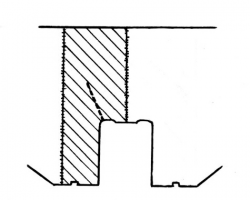 This requires the use of the burning gear, as the slag in the corners portrays. The top horizontal stretcher supporting the pony truck pivot has been removed and the lower stretch found, as expected, to be in good condition. A new upper stretcher is being fabricated and seen here placed in position, but not yet attached. 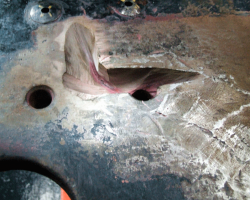 To the left is one of the spring hanger brackets, awaiting its turn for removal. The bad news: attempts at repairing the frame crack to the right driving horn gap opened up another pre-existing crack, repaired during BR days. Although highlighted in red, the black of the crack itself is very visible. Another close up view of the offending crack in the Frames. 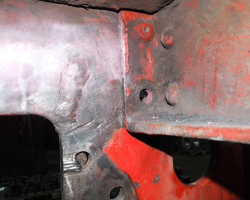 From between the frame, things don’t seem as bad, but the two welded repairs are obvious. 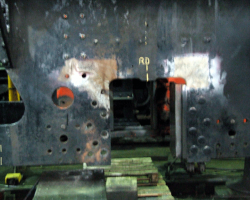 The SVR and Fund have decided on a far more thorough repair, which involves cutting out the entire section of main frame encompassing the cracks and replacing it with new steel. This was a standard system by BR when dealing with Black Five frames. 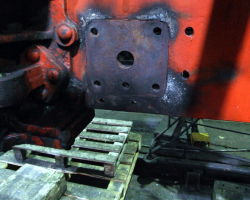 The SVR and Fund have decided on a far more thorough repair, which involves cutting out the entire section of main frame encompassing the cracks and replacing it with new steel. This was a standard system by BR when dealing with Black Five frames. In our case, the section will be much larger, between the dotted yellow lines from the centre of the horn gap and the large cut-out at the extreme left side. 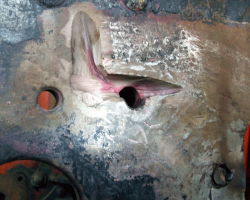 This ensures that the area to be welded is kept to a minimum. Work has already begun on drilling out the rivets securing the stretchers between the frames.